The R.L. 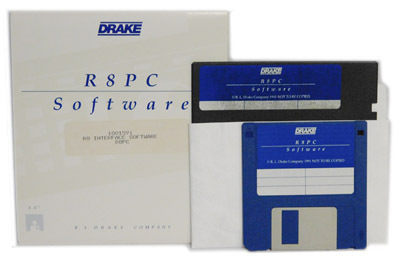 Drake Company has been a leading name in American electronic communications since 1943. The Drake R8A continues the in the proud tradition R8. The R8A is a microprocessor-controlled, synthesized, all mode, world band receiver offering excellent sensitivity, high dynamic range and other features for the most demanding listener. It has been designed as a "complete package." You get many items as standard-equipment, that would be extra on other receivers. Multimode reception (AM, FM, USB, LSB, RTTY and CW) is featured throughout the range of the receiver (100 kHz to 30 MHz). A high-Q, 8-pole, electronically switched IF filter provides a range of five bandwidths. User selection of bandwidths is now available with one keystroke independent of mode (or automatic). 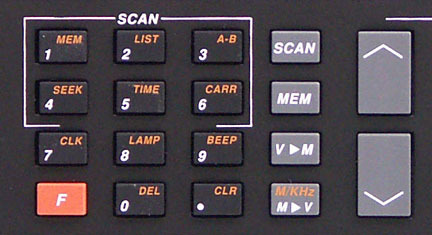 The improved, easier to read, front panel display provides visual feedback to the operator of the current status of the receiver. In the AM mode, a selectable synchronous detector (SYNCHRO) allows for enhanced reception by eliminating or reducing distortion due to fading signals. A Passband Offset control also aids in reducing or eliminating interfering signals by electronically shifting the receiver's IF frequencies without disturbing the operating frequency. This action allows the operator to electronically move interfering signals out of the receiver's passband thus utilizing the degree of selectivity provided by the high-Q, 8-pole IF filter. The Passband Offset is also coupled to the synchronous detector (SYNCHRO) allowing the passband to be altered while the detector is in use. Other reception aids include selectable AGC, wide/narrow noise blanker, RF preamplifier for enhancing weak signals, RF attenuator for further improvement of strong signal handling capabilities, tone control and an adjustable RF gain. A Notch filter is also supplied as an effective tool to eliminate offending tones (heterodynes). 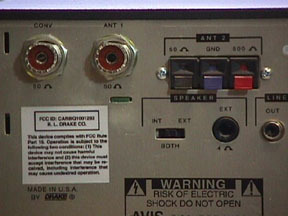 A muting control allows operation with a transmitter or transceiver. The R8A provides exceptional audio to the built-in speaker. 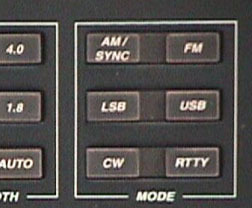 Two VFOs (tuners) called A and B, are provided on the R8A. Selection is made with the VFO function key. Frequencies can be directly entered through the keypad. A programmable memory area allows for 440 nonvolatile alphanumeric memories. The following may be stored in any memory location: frequency, mode, bandwidth, AGC setting, RF setting, antenna, notch on/off, noise blanker setting and synchronous detector on/off. As a result of three scan methods and three scan modes; nine distinct scan functions are supported in the R8A. The three methods are: Stop at carrier detect, Pause 5 seconds on carrier and Pause at carrier until carrier drops for 5 seconds, then resume scan. The three modes are: Scan all memories, all unlocked memories of user-selected list or Scan from VFO A to B. The memory scanning speed has been increased to 40 channels per second. The R8A has two 24 hour clock-timers to allow the R8A to turn on and off at preset times. 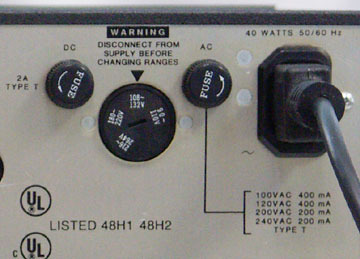 The AC input voltage is switch selectable. 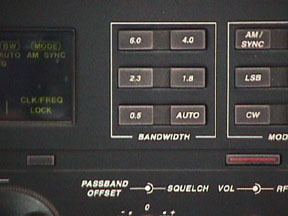 In addition, the rear panel Timer connection (5 pin DIN) allows control of small recorders, etc. to record a favorite program. 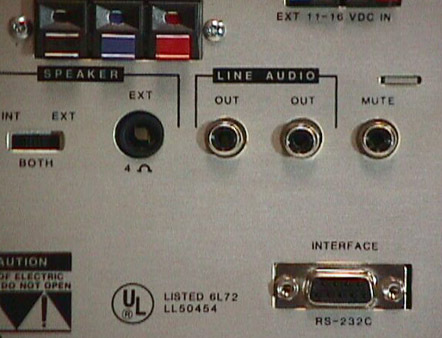 The R8A rear panel provides a common DB-9 connector for standard RS-232C data communications with a terminal or personal computer (9600,1,7,1,even). This interface provides complete control and programming capability of the R8A including reports of frequency, mode, memory channel, name and signal strength. Only the analog controls such as volume, RF gain, etc. are not controllable. There is also antenna inputs for coaxial lead in for wire type antennas. * More Memories: 440 memory positions. * Event Timers/Clocks: Two Timers. The time may be programmed to remain on at all times.